When software developer Tor Sigve Taksdal tasted a high-end coffee from Ethiopia but could not find a similar coffee elsewhere, he took matters into his own hands. “The disappointment led me to do some research on coffee beans, and it made me want to try roasting beans for myself,” says Taksdal. His passion for coffee and software development led to the creation of Austrått Kaffebrenneri, where the Norwegian today offers sustainable and delicious specialty coffee to fellow coffee lovers. 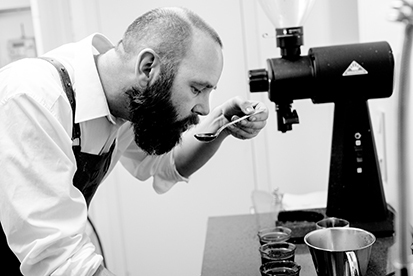 his growing business delivers quality coffee, made primarily from African and Latin-American beans, to over 30 cafés, hotels and businesses around Norway, while currently receiving requests from other parts of Europe too. “I have recently invested in a brand-new coffee roaster and moved into new premises in Sandnes to meet the increasing demand,” Taksdal says proudly. “All my roasts are quite light and tailored to the country of origin and the processing method, so you can taste the origin of the beans. They’re also very fresh, because I roast on demand only,” he says. All his coffee is cupped and quality controlled before it is shipped. Cupping is a technical tasting to discover flaws in the cup, either from the beans or from roasting defects. New to his list of craft coffee is the trendy cold brew, available in cans and bottles. Cold-brew coffee is not to be confused with iced coffee, which is brewed hot before chilling; instead, this new craft coffee is roasted, grounded and then steeped in cold water for quite a few hours. “I have been testing cold coffee for four years now to find the best method. My cold brew is made by extracting coffee with cold water over time, while some nitrogen is added to preserve the aromatics,” the coffee specialist explains. His current batch is made with natural processed coffee from Yirgacheffe in Ethiopia. With a passion to promote specialty coffee, Taksdal is delighted to see the popularity of his products rise thanks to word of mouth. “I am so happy when people discover the flavours themselves. When customers have tried one of my coffees at, for example, Ostehuset in Stavanger and contact me, it is very enjoyable and encouraging,” says Taksdal. Taksdal is also one of only four distributors in Europe delivering nitro-coffee on KeyKegs, an innovative way to use oneway beer kegs for coffee brewing. As the only Scandinavian to use this method, Taksdal makes it possible for all bars and restaurants already using taps to also dispense his cold brew. “After programming logistics for 20 years, I’ve developed a creative curiosity, so I just tried to come up with a method to get this as smooth as possible. I then talked to KeyKegs, who thought I was onto something exciting and new, which resulted in a great ongoing collaboration,” says Taksdal. With some other original coffee-related projects in the pipeline, it will certainly be interesting to see what the Norwegian coffee specialist will do next.